This photo is of an asymmetrical anticline in the Stanley Formation. It’s asymmetrical because the right limb of the fold is dipping at a steeper angle than the left limb. 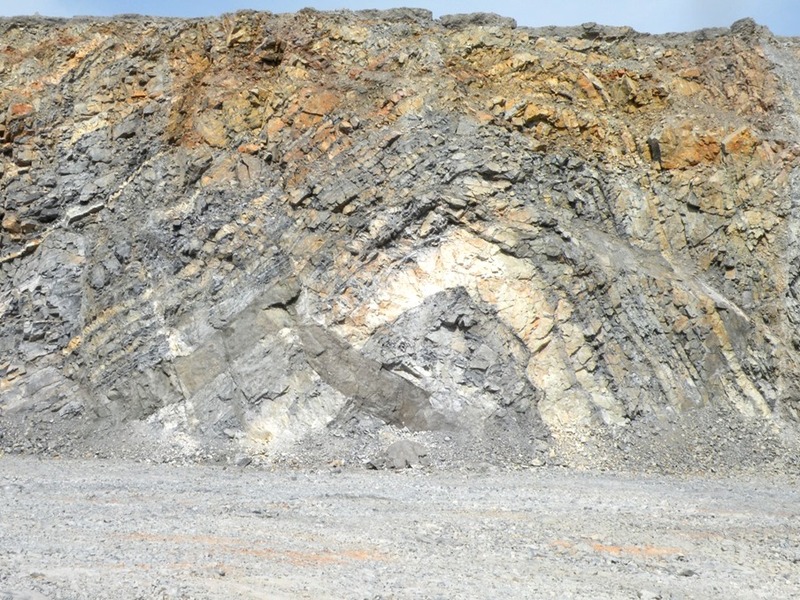 This type of fold is common in the Ouachita Mountains, however, this one has a small igneous intrusion on the left limb (lower left, dark gray). The intrusion consists of a dike, which split several of the lower beds at nearly a right angle, and a sill emplaced parallel to the bedding. From this picture, and basic geologic principals, we can tell the history of these rocks. Sediment was first deposited in horizontal layers (principal of horizontality). Later, the layers cemented to form solid rock – the layers must have been firm before they were deformed because they maintained their shape. Next, tectonic forces in the earth bent the rock into an anticline and, after it was folded, the igneous intrusion was forced into the rock. We know the intrusion was last because it cut across the rock layers and the fold (principal of cross-cutting relationships). One of the most challenging aspects of geology is interpreting a lot from a little information. It’s also part of what makes it so interesting! 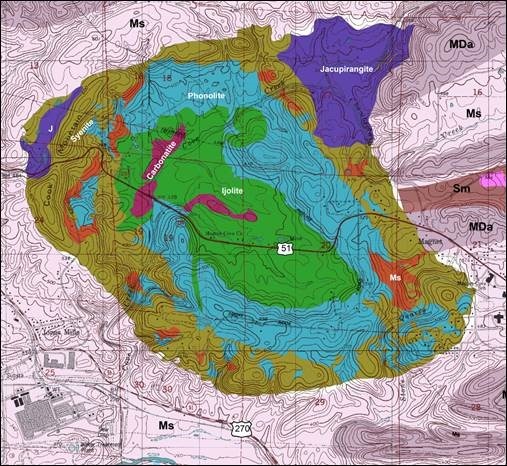 This entry was posted in #geoblog, GeoPic of the Week and tagged anticline, Arkansas, asemmetrical anticline, dike, Igneous Intrusion, Ouachita Mountains, sedimentary rock, sill on November 18, 2015 by argeology. Igneous rocks are rare in Arkansas, making up about 0.1% of the surface area of the state. Nonetheless, we find some interesting and unusual rocks and minerals within our igneous rocks. 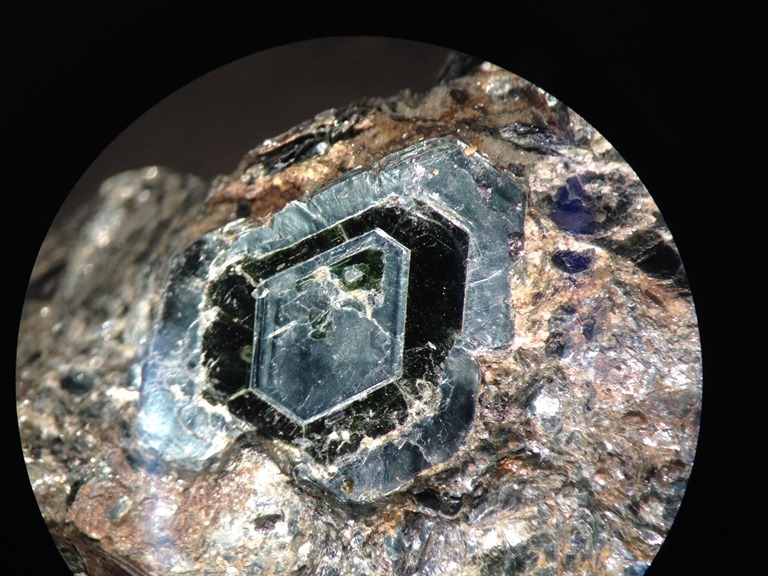 The above picture is a pseudohexagonal, zoned, green biotite crystal collected from Magnet Cove, Arkansas just last week. That’s a mouthful! Magnet cove is a 100 million year old igneous intrusion, now exposed at the surface 12 miles east of Hot Springs, Arkansas. In that little area, over 100 mineral species have been identified, including some that were first discovered there. Students, researchers, and mineral enthusiasts come from all over to visit Magnet Cove, collect samples, and learn about this geologically fascinating place. 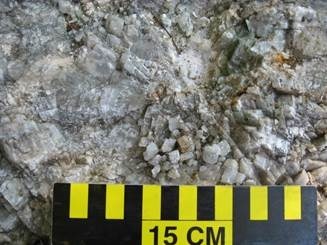 This entry was posted in #geoblog, GeoPic of the Week and tagged Arkansas, biotite, Hot Springs, Igneous Intrusion, Ijolite, mineral collectors, zoned crystal on October 29, 2015 by argeology. We stopped at numerous locations in Pope, Conway, Pulaski, Saline, Hot Spring, and Pike counties. The first day, we headed up to the northernmost igneous intrusion in the state which is north of Dover just off Highway 7 on Dare Knob. From there we stopped at several carbonatite sills (igneous intrusions that follow sedimentary bedding planes) in the Arkansas River Valley near Oppelo. The next day we started out with a visit to the 3M quarry on Granite Mountain. Granite Mountain is actually a relatively small exposure of an igneous batholith which extends to an area of over 250 square miles in the subsurface. 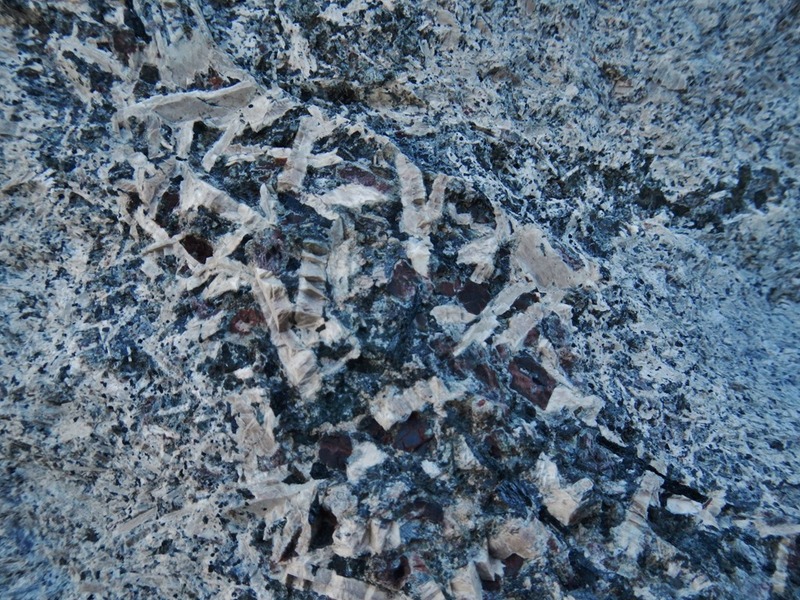 Also, it is not actually granite at all, but nepheline syenite. It is being processed mainly into roofing granules. 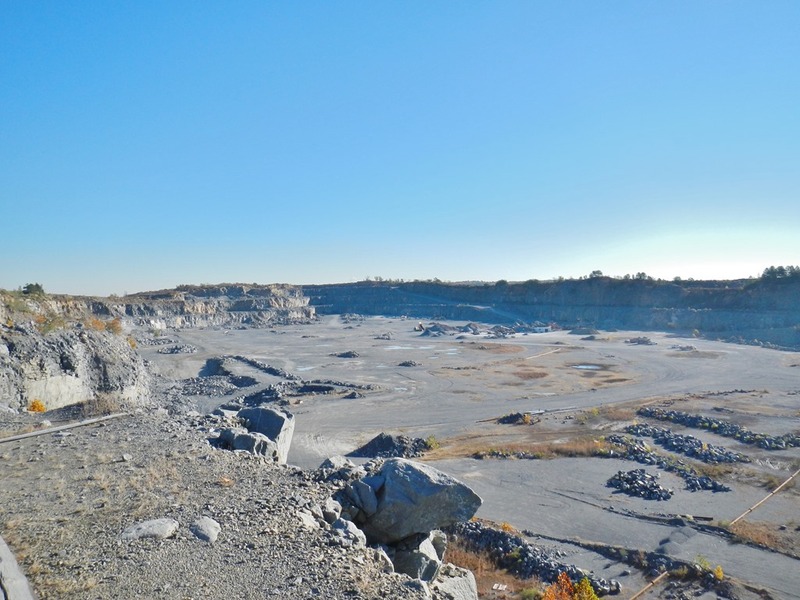 The other large active quarry in the area, Granite Mountain Quarry, produces mostly aggregate materials. From there we went to Bauxite where we saw a large olistolith in the syenite. A xenolith is a piece of the country rock that is incorporated into the melt of an igneous intrusion. 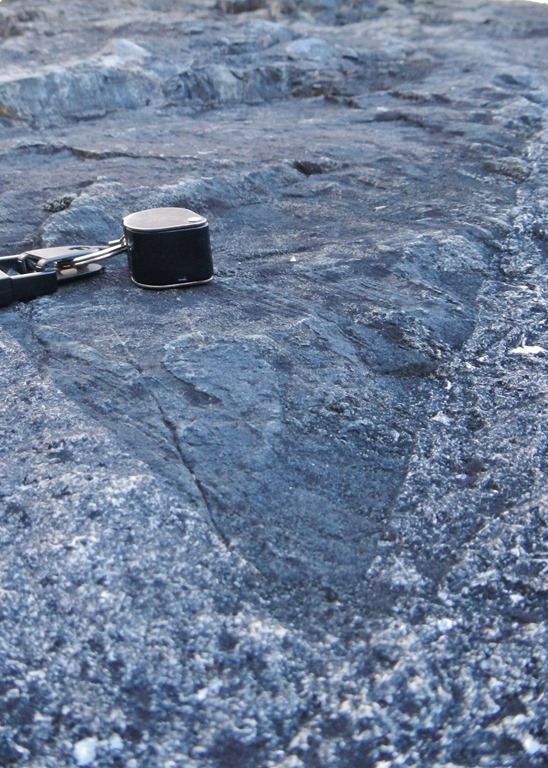 In this case the country rock was probably Jackfork Sandstone as evidenced by tight folding in a quartzitic rock slightly metamorphosed by contact with the igneous body. From there we made several stops in the Magnet Cove area, where we saw broken phenocrysts (large crystals in a finer matrix) of pseudoleucite, carbonatite, garnet, rutile and pyrite. We also saw the largest barite pit in the U.S. (now abandoned), and a nearby vein of smoky quartz that was easily accessible. 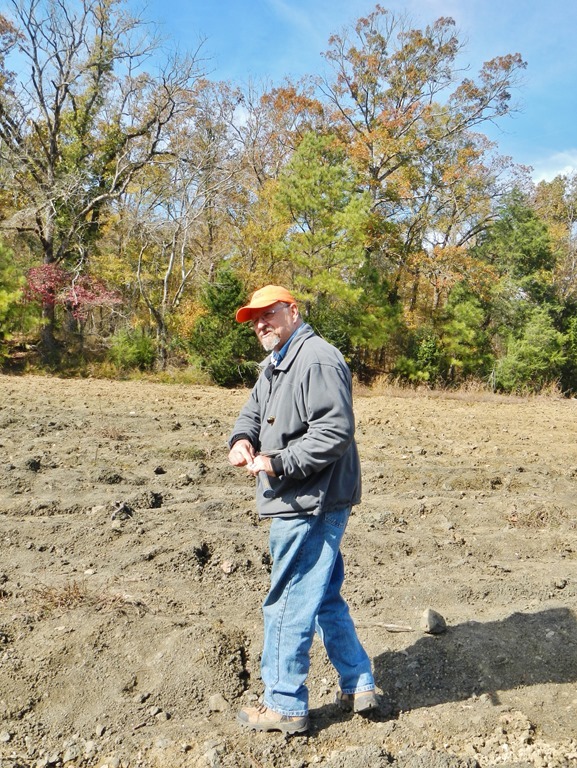 The next day we drove to the diamond mine at Murfreesboro, with which Mike has had an association since even before it was made a state park. I found a good barite crystal, but unfortunately, no diamonds. These trips were attended by almost the entire staff, and we much appreciated getting to see these rare rocks and minerals with knowledgeable commentary by the state’s most expert resident. We will miss having him at the survey to answer our many questions, but hope that he enjoys many years of well-deserved leisure activities. Thanks, Mike!! Until next week, I’ll see you on the outcrop! 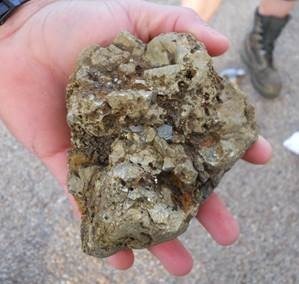 This entry was posted in Notes From The Field and tagged 3M quarry, Arkansas River Valley, Bauxite, carbonatite sills, Dover, Granite Mountain, Highway 7, igneous, igneous batholith, Igneous Intrusion, Magnet Cove, Murfreesboro, nepheline syenite, Oppelo, phenocrysts, Quartz, xenolith on January 27, 2014 by argeology. 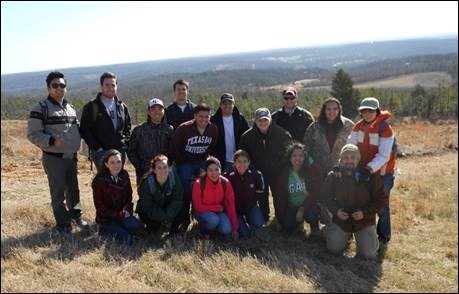 On Saturday, January 18, 2014, Bill Prior and I met up with sixteen students, ranging in age from freshman to seniors, from the Texas A&M Geology and Geophysics Society. We started the morning at 9 a.m. with a brief introduction on the geology of Magnet Cove at the Sinclair gas station along Highway 51 in Magnet Cove. Everyone was freezing, but you could tell they were super excited to start the day. Magnet Cove is an area of unusual petrologic and mineralogic interest that derives its name from the presence of lodestone in the soil and from its basin-like shape. 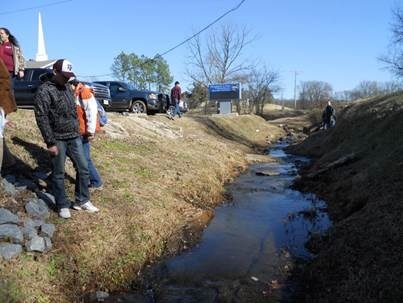 It is located in northern Hot Spring County, Arkansas, about 12 miles east of the city of Hot Springs. The diameter of Magnet Cove is about 3 miles (running northwest to southeast) with an overall area of less than 5 mi2 (Howard, 2007). The Cove is an intrusive igneous body created by mantle-derived magma that pierced through existing Paleozoic sedimentary rocks (Figure 1, listed as Sm, MDa, and Ms) of the Ouachita Mountains approximately 100 million years ago (Late Cretaceous). Figure 1. Generalized geologic map of Magnet Cove. 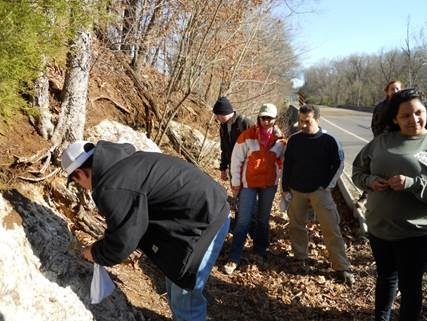 Our first stop was along HWY 270 (Figure 2) looking at the Mississippian Stanley Shale (359-323 million years old). 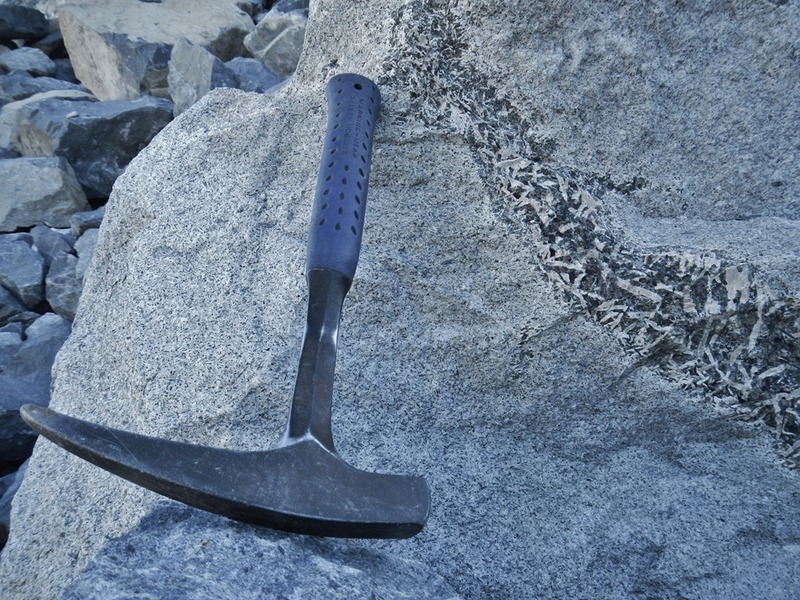 The Stanley Shale is composed primarily of sandstones and shales deposited in a deep ocean basin. 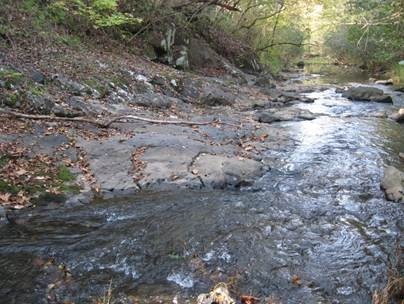 These deposits were later faulted, folded, and uplifted during the Ouachita Orogeny (Ouachita Mountains) approximately 323-307 million years ago (early to middle Pennsylvanian Period). Figure 2. 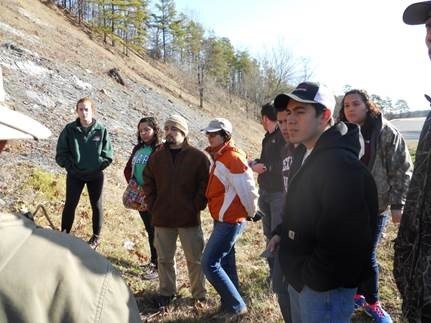 Looking at the Mississippian Stanley Shale. Everyone was clearly excited. Our second stop was along Ross Cuttoff Road where we looked at the Garnet Pseudoleucite Nepheline Syenite (GPNS). Now say that mouth full five times fast. Although there were just a few boulders in the ditch, the phenocrysts of pseudoleucite were very prominent. Figure 3. A sample of the Garnet Pseudoleucite Nepheline Syenite. While learning all about GPNS, one particular nice gentleman stopped by to show us his great garnet, rutile, magnetite, and possibly brookite crystals that he collected from his yard. These crystals were absolutely amazing. As we were looking at his collection, another enthusiastic gentleman pulled up telling us all about his beautiful property and all of the different rocks for us to collect. Well of course we were excited, so we jumped in our vehicles and took off. As we were driving, Bill and I noticed how we were traversing over the syenite rim and out of the basin-Oops. 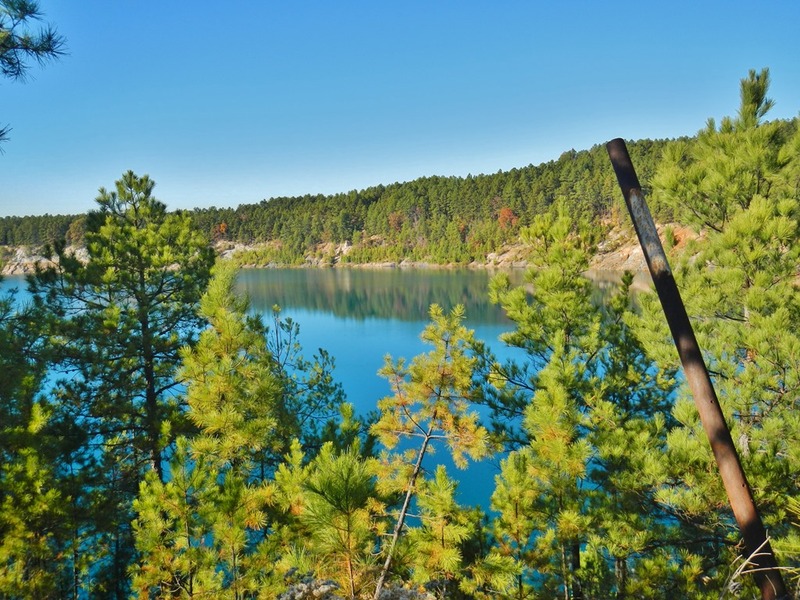 When we arrived at his property, we were amazed by the beautiful view, particularly the view of the Magnet Cove basin. And, he did have a variety of rock, but mostly of red, white, and gray Arkansas Novaculite. Figure 4. All smiles and thumbs up for Magnet Cove (background). Here we stopped at the old American Titanium Pit where rutile (chemical composition of TiO2, or titanium oxide) was mined during WWII. We collected pyrite cubes and rutile from this pit. It was pretty muddy, but everyone managed. What troopers! After lunch, we headed to the old Kimzey Magnetite Pit along Highway 51 where we collected lodestone, rutile, and garnet. 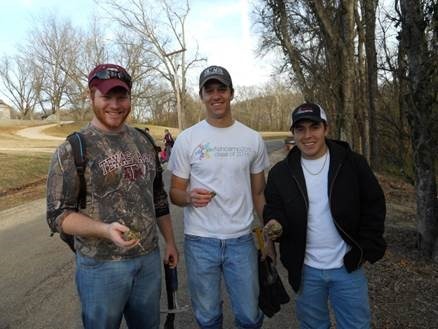 A few also found pieces of possible Kidney-Ore hematite and phlogopite. This spot seemed to have it all. Plus, everyone enjoyed using the compass to determine whether or not they had lodestone. A stronger lodestone will really spin the compass needle. Also, the highly magnetic soils in this area make it almost impossible for anyone to use a compass in Magnet Cove. 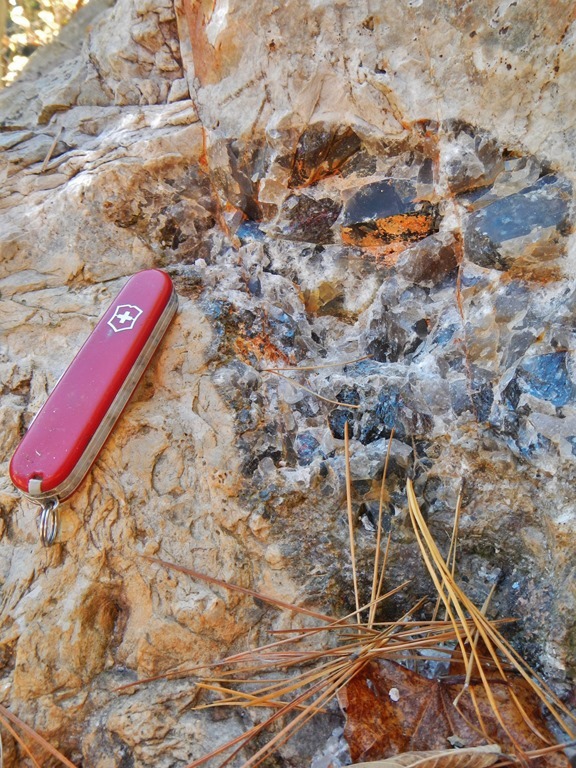 About a quarter-of-a-mile west of stop 4 along Highway 51, we stopped to collect coarse-grained garnet, biotite ijolite. Ijolite is a feldspar-free, nepheline-rich igneous rock. At this location, we were able to pick up smaller biotite booklets that had weathered out of the boulders present in the ditch. Figure 5. Checking out the garnet, biotite ijolite. Unfortunately, we needed a pick and sledge to break off pieces of the boulder for collecting, which no one had. 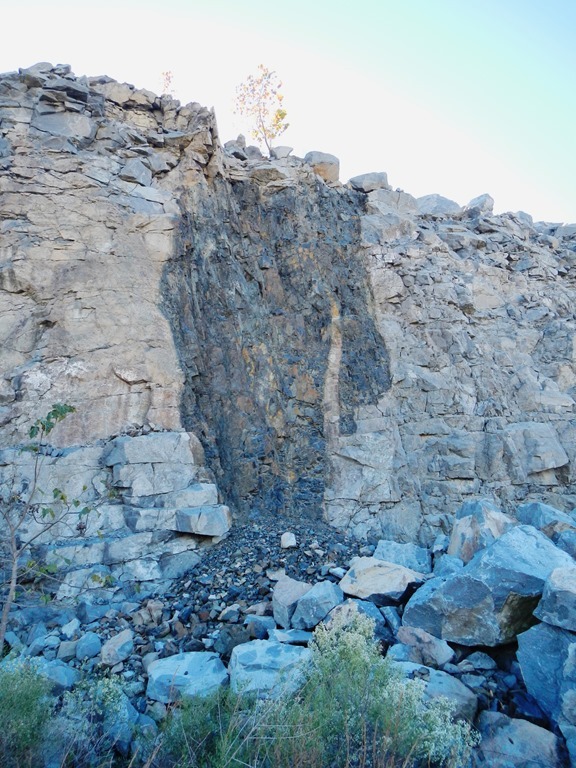 Adjacent to the old Kimzey Calcite Pit about one half mile west from Stop 5, a great carbonatite outcrop is exposed here just west of the bridge. 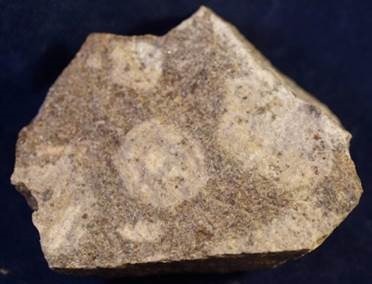 This particular carbonatite looks identical to calcite, but is different in the fact that this carbonatite is an igneous rock derived from the mantle. Carbonatite even fizzes like calcite. Some other minerals that can be found with the carbonatite include carbonate-fluorapatite (light yellow-green), monticellite (brown), biotite, magnetite, pyrite and perovskite. Also, this is the type locality for kimzeyite, a dark brown zirconium-rich garnet (Howard, 2007). Figure 6. Getting up close and personal with the carbonatite. Check out those rhombs. 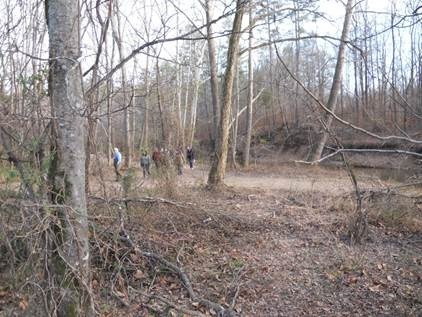 Our last and probably most exciting stop was located IN Cove Creek. Although the day had warmed up quite nicely, the creek was still very frigid (and deep). 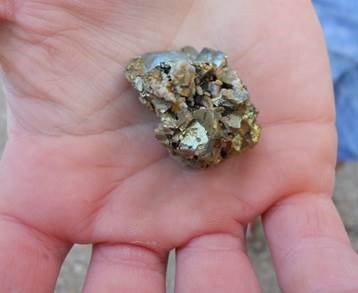 After Bill showed off his awesome pyrite cubes with molybdenite that he had found in the creek 30 years ago, there was no turning back, we were finding pyrite cubes with molybdenite. Only Bill and I were lucky enough to have waders and boots, but that didn’t stop some of the others from jumping in. 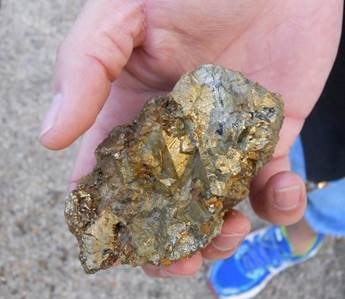 We trudged up the creek with no luck and quickly came back to where we started only to find nice pyrite pieces in the creek (of course). A few in the group pulled out nice hand-sized specimens with the molybdenite coating. How awesome! Figure 7. Leaving the creek with gold in hand, fool’s gold that is. Figure 8. Success in the cove with nice samples of pyrite. Figure 9. 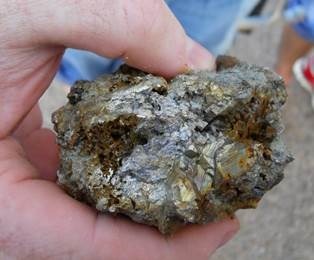 Close-ups of the pyrite found in Cove Creek. Figure 10. Jacupirangite in the creek. Howard, J.M., 2007. Magnet Cove, A Synopsis of its geology, lithology, and mineralogy. 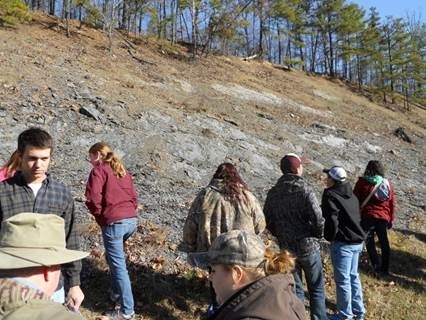 Arkansas Geological Survey. AGES, Brochure Series 004. 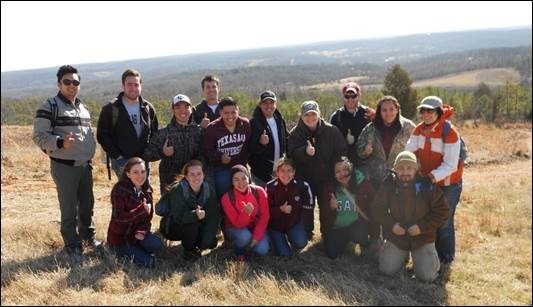 11 p.
This entry was posted in Field Trip and tagged carbonatite, Cove Creek, Igneous Intrusion, Igneous Rocks, Ijolite, Jacupirangite, Magnet Cove, Magnetite, Pyrite, Rutile, Stanley Shale, Syenite, Texas A&M on January 23, 2014 by argeology.